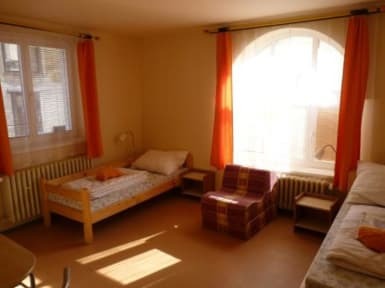 Comfortable accommodation in the centre of the historical town - Tabor - South Bohemia. The gently undulating region of the Tabor Uplands is an ideal spot to spend a pleasant holiday. There are a number of popular sites in the region including castles (Kotnov Castle in Tabor, the ruins of Kozi hradek in the close vicinity, Stary zamek near Borotin, Choustnik, Pribenice), chateaux (Bechyne Chateau, Cervena Lhota on the boundary of the Tabor and Jindrichuv Hradec regions) and unique technical works (the Stadlec Chain Bridge). Flat marshland lies to the south west of Tabor, with examples of typical South Bohemian folk architecture, peat bogs and extensive forests. The countryside around Tabor offers ideal conditions for hiking, cycling or horseback riding. Other places to visit in the region include interesting natural sites Chynov Cave, The Botanical Gardens in Tabor or the educational trail at Borkovickz blata (marshlands). The Luznice River, which meanders through the entire region, invites you to take a trip by canoe or to enjoy a quiet spot of fishing. The Tabor region is full of lakes, that are largely used for recreation. Caravan parks, hut colonies and water sports camp sites line the banks of the river and many lakes.